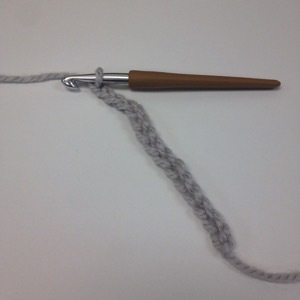 In my last tutorial, I showed you how to crochet a tube in a certain way, by joining rounds. However, you can also crochet a tube in spirals. For the purpose of practicing this skill, we’ll make a small swatch in this tutorial. Yarn and hook size don’t matter for this practice swatch. You may mouse over images for left-handed views. Foundation: ch 15. The photo below shows this completed. The inspiration for this post came from the wonderful comments in one of my previous posts, Crochet is Child’s Play. I loved hearing everyone’s stories about learning crochet and then passing it on. One Crochet Spotter, Pearl, mentioned that she was trying to teach her six-year-old brother and asked for advice. Before long, Marcia G (a fellow Crochet Spotter) directed Pearl to Rachel’s “How to Crochet” instructions. Hooray! This is EXACTLY what the Crochet Spot community is about! Hooray for Tunisian Crochet! Since I gave you 3 Reasons to Try Tunisian Crochet, have you done it yet? Well, if not, grab your long crochet hooks and join me! A while back, Rachel posted a great photo tutorial of the “setup row” of Tunisian crochet, which is the standard first row in each Tunisian crochet project. 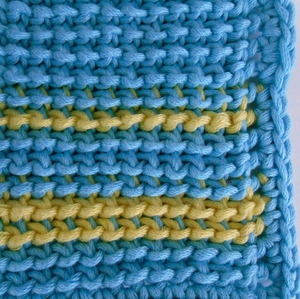 The tutorial can be found as steps 1-13 of the Tunisian Simple Stitch Tutorial. Please note: Steps 11-13 of the Tunisian Simple Stitch Tutorial could also be called, “How to Work the Reverse Pass in Tunisian Crochet”. These steps remain the same in all basic Tunisian crochet patterns. Rachel also posted the beautiful Tunisian Knit Stitch Tutorial! Today we’re going to add a stitch to our library by learning the Tunisian Reverse Stitch, abbreviated (Trs). Tunisian reverse stitch swatch worked in bulky yarn with sc border. 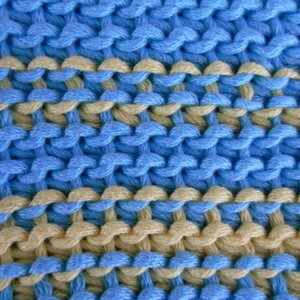 Crocheting between stitches is an alternative to crocheting through both loops, back loop, or front loop. The resulting stitch is effectively a little shorter than a normal double crochet, and the stitch pattern becomes more open. 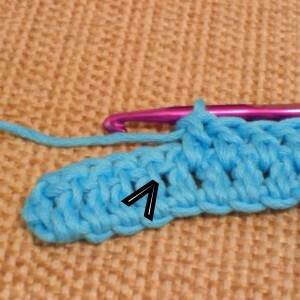 To double crochet between stitches, the crochet hook will be inserted in the space between the stitches, as indicated in the picture below.